It is an ancient and diverse, yet complex tradition among the many dragon legends and recounts that have been written down over the last few hundred years. 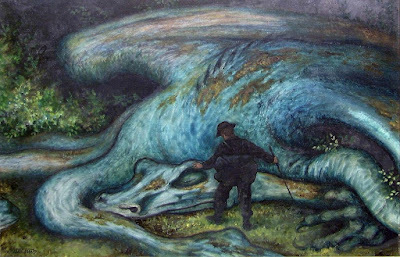 Even today, the dragon might be the most well-known and renowoned fantasy creature of them all, regardless if one chooses to embrace the world of fantasy or not. Whether it be George R.R. Martins Game of Thrones, Tolkiens's The Hobitt, Astrid Lindgrens The Brothers Lionheart or Walt Disney's Sleeping Beauty. However; without the belief that there was such a terrible supernatural being in concrete and tangible sense, this tradition would hardly have survived for so long. Let's turn the clock, a few years back time. "God help us, this star is called cometa, and denotes either a lord's death, a shed of blood or other plagues to come." On moonlit evenings, small flames of fire sometimes appear across the sky, moving through the air with great speed, with the shape of a broomstick. They are believed to be living beings, called dragons, possessing the ability to breathe fire, casting its flames on men. In the folk belief, the dragon was a snake-like, fire-breathing monster with a long tail, a horses' mane, and wings and claws on hands and feet. It could not bear the light of day, and was most likely to be seen at dusk, dark as night, spewing fire as it flew from mountain to mountain. When the dragon appeared, it was normally a token that something bad was in store - an accident, fire, war, famine, disease, death; for the ungodly, it was a reminder to be aware. Neither prehistoric giant lizards or physical celestial bodies can fully explain the origin of the dragon. Today, it is believed that the answer might be found in ancient serpent myths, because the dragon was primarily conceived as a worm with roughly the same characteristics. The animal's Greek name dracon (Latin: Draco) is really a term for snake. Primarely, this creature symbolizes the evil and dark forces of the world, emerging as the enemy of gods and mankind. 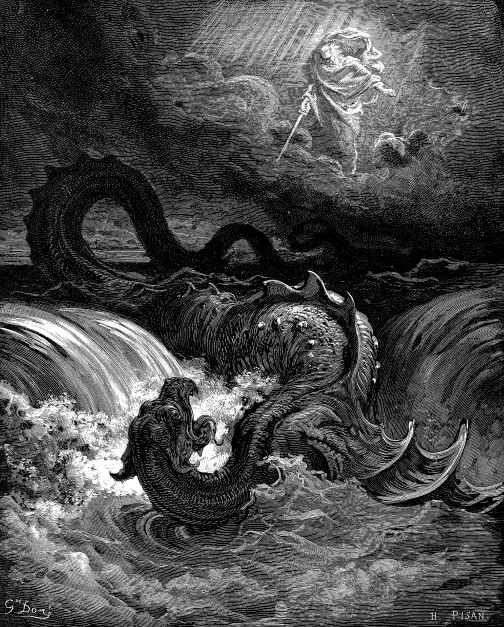 The Old Testament recounts the tale of Leviathan, a seven headed sea monster which God himself breaks to pieces, and in an apocryphal addition to the book of Daniel, the prophet took the life of a great dragon revered by the Babylonian kings. And there appeared another wonder in Heaven; and behold a great red dragon, having seven heads and ten horns, and seven crowns upon his heads. [...] And his tail drew the third part of the stars of heaven, and did cast them to the earth. That beging said, notions of a giant serpent or dragon was found in the ancient oriental culture long before the Christian era began. The Babylonian creation myth Enuma Elish, tells the tale of how the Babylonian national god Marduk defeated Tiamat, the dragon of the primordial sea, and saved the realm of gods of armagaddon. The Greek serpent god Typhon had a hundred dragon heads with fiery eyes and a fearsome voice. But Zeus killed him with a thunderbolt and buried him under a volcanic mountain. Niðhöggr nái. Nú mun hon sökkvask. A natural consequence of the belief of such creatures, is that there will always be someone bold enough confront them. The most famous dragon slayer among saints is St. Georg (in the Nordic lands, also called St. Jorgen). He was an officer in the Roman army, but because he was a Christian, he refused to join the Emperor Diokletioans Christian persecutions. After fierce tortures he was beheaded in Palestine in the year 303, later becaming one of the most venerated saints in Christianity, especially by the Crusaders. The legend tells that the dragon Georg defeated, took abode in Libya and daily demanded a young virgin victim. Finally, there was only one left - the king's own daughter. She was set to die when Georg came riding past and killed the dragon with his lance. but believing in his Christian chastity ideal, he denied the princess's hand and went on his way. 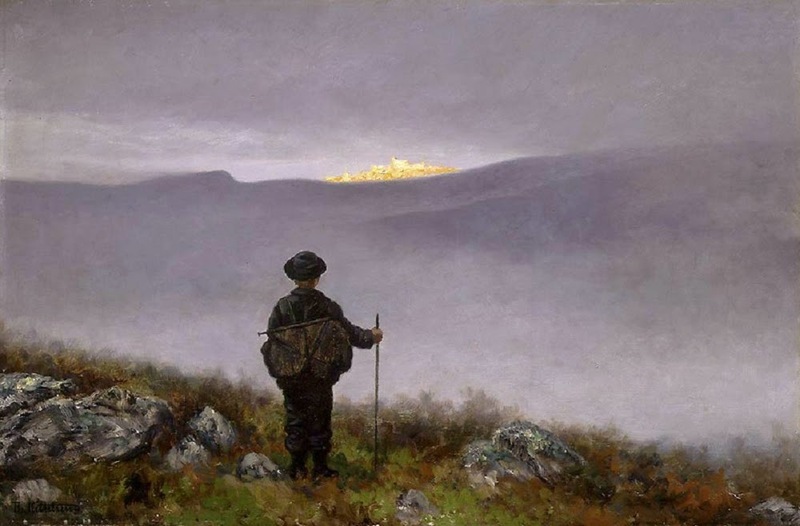 In the Norse countries however, St. Georg lost the competition with another dragon slayer, who spoke more to the ancient Norsemens' thoughts and feelings; the Germanic hero Sigurd. The story is, as with many of the ancient sagas, really quite cruel - which maybe the main reason why it became so popular. 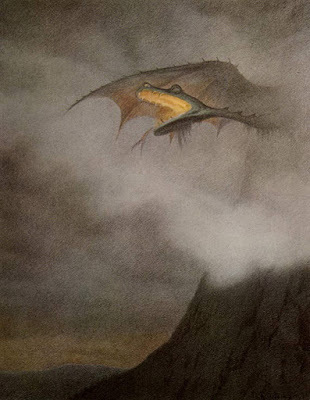 The dragon Fafnir in which takes center stage, was originally a dwarf, yet was transformed by the ring called Andvarenaut, initially belonging to the dwarf Andvare. Andvare was killed by Loki and the treasure was appropriated by the dwarf Hreidmar. But the ring was cursed, and Hreidmar was killed by his son, Fafnir. 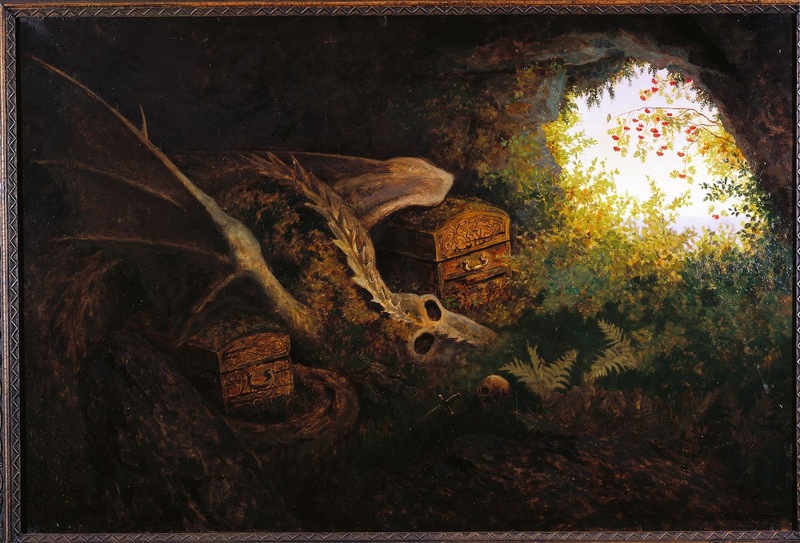 When Fafnir took the ring for his own, he was transformed into a greedy dragon who guarded his treasure in solitude. However, Sigurd killed Fafnir with his sword Gram ("Gram" meaning wrath). The sword was originally broken in two, but the master blacksmith Regin reforged the sword, and convinced Sigurd to kill Fafnir and retrieve the treasure. And so Sigurd took his sword and went up to Gnitahei, Fafnir's lair, stabbed the creature in the heart, thus earning him the epithet Fafnirsbane. Such treasure-guarding monstrosities are featured in both oriental and ancient sources. The same can be said about the origins of the flying dragon. The Roman poet Ovid (43 BC - about 18 AD.) wrote about winged dragons pulling Medeas chariot across the sky. And in the Old English epic poem Beowulf from the 700s, the prelude recount that a slave discovered the guarded treasure and stole a golden cup. When the dragon sees that the cup has been stolen, it leaves its cave in a rage, burning everything in sight. The dragon has also had a strong and concrete symbolic value in folk art and religious imagery. 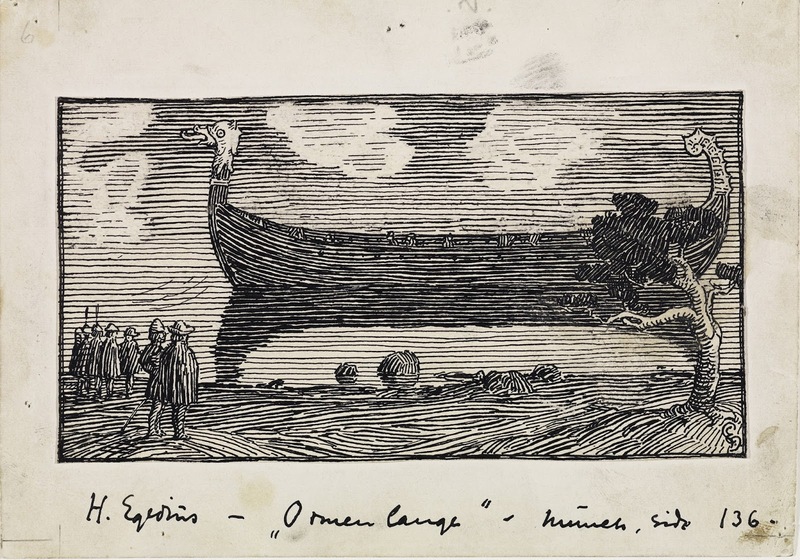 The dragons were the designation of large long ships equipped with animal-like heads in the front row. The dragons were generally the largest ships in the fleet, usually the ship of a king or a chieftain. Snorri Sturlason's kings' sagas refer to several ships as "dragons". It therefore appears that the term "dragon" could be used in several of the long ship types if the ship was equipped with dragon head. Most famous of these is undoubtedly Ormen Lange (The Long Serpent), the Norwegian equal to the HMS Victory in the UK and Vasa in Sweden. It was built for the Norwegian King Olav Tryggvason, and was the largest and most powerful longship of its day. Stave churches appear to sometimes to have built upon or used materials from old pagan worship sites and are considered to be the best evidence for the existence of Norse Pagan temples and the best guide as to what they looked like. 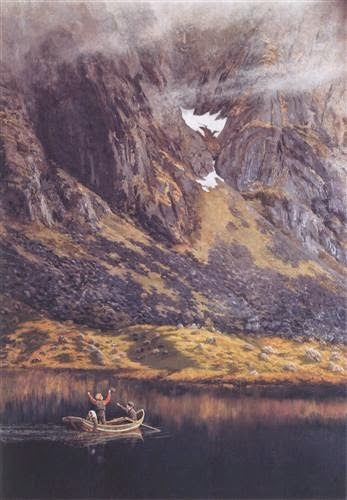 The inclusion of dragon heads and other mythological symbolism suggests a cultural synthesis of Norse mythological beliefs and Christianity. As you travel up in Norway's mountainous countryside, you still meet church buildings with amazing shapes, which look rather like demonic idols, than God's house, with its pulled-out gables that rise one above the other with its steep ceilings and low walls - like one think of the medieval shielded dragons - these are the Norwegian stave churches. 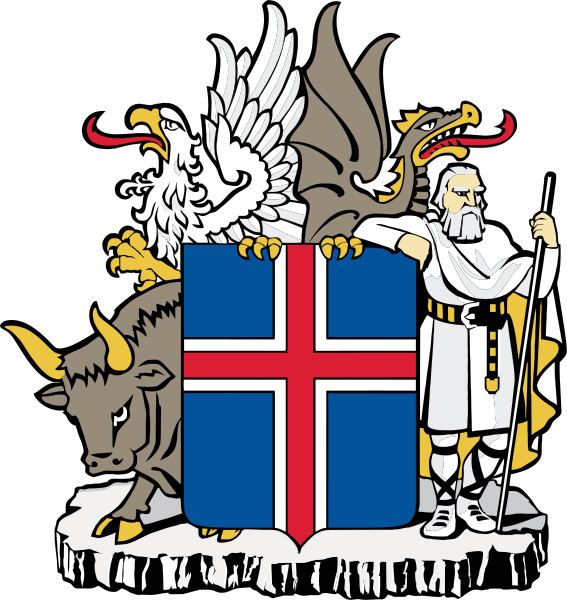 The Icelandic coats of arm: the dragon (Dreki) protects the southeastern part, and the rock-giant (Bergrisi) is the protector of southwestern Iceland. 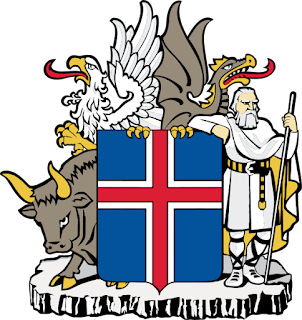 Great respect was given to these creatures of Iceland, so much that there was a law during the time of the Vikings that no ship should bear grimacing symbols (most often dragonheads on the bow of the ship) when approaching Iceland. This was so the protectors would not be provoked unnecessarily.